Bead, Swarovski® crystals, Montana AB, 3mm Xilion bicone (5328). Sold per pkg of 48. Item Number: H20-3321CY Have a question about this item? Montana echoes the color of a western mountain sky in rich, saturated smoky blues. 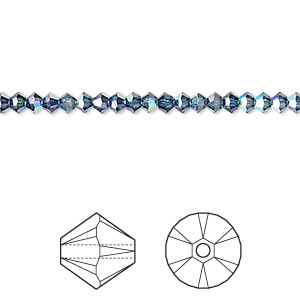 Swarovski's signature AB effect, named for the aurora borealis (northern lights), was created by Swarovski in 1955 in collaboration with Christian Dior. The effect is achieved by vapor blasting the facets of the lower part of the crystals with an invisible, micro-thin metal sheet. Bead, Swarovski® crystals, Montana AB, 3mm Xilion bicone (5328). Sold per pkg of 144 (1 gross). Bead, Swarovski® crystals, Montana AB, 3mm Xilion bicone (5328). Sold per pkg of 1,440 (10 gross).